Those familiar with the show know the rock musical horror comedy pulls out all the stops to create a whimsical tale unlike anything else seen on stage. A man-eating plant, meek floral assistant and soundtrack that nearly everyone knows at least one song from ensures the audience always has a screaming good time when it comes to town. 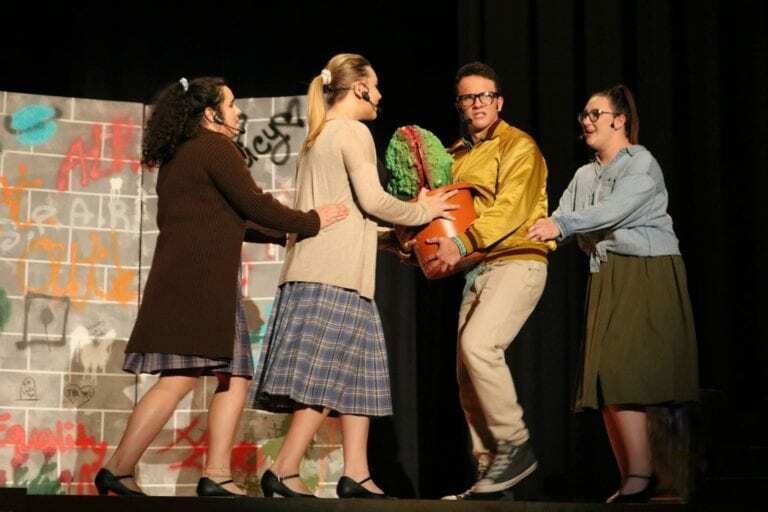 This performance has another layer to its mix as the lead cast and crew are comprised of the seniors that have grown the program into the roaring success it is today. The team has won a plethora of superiors at competitions — including scoring a superior at state just last month — and also won the prestigious national NBC R.I.S.E America grant. They’ve proven Plant City has more than just impressive sports teams and have begun to put the city on the map for its captivating theater program. Dalton Vanderford could have graduated last year after completing all of his credits early. However, his love of theater had him hang on for one more year and he’s helped transform the program into a force to be reckoned with. His skill set is a mile long ranging from costume creation to carpentry to stage management. He’s watched as Schmidt led her students to greatness and worked tirelessly to help make each and every production, whether it be a musical like Aladdin or a straight play like Harvey, be flawless. Being as it’s the last play for much of the cast, Vanderford said it’s a bittersweet experience, but one they’re all excited to make the best show of their high school career. Courtesy of Jennifer Hamilton. Chris Dulje in the upcoming production. Chris Dulje, senior, is also bracing himself for their final adieu. Courtesy of Jennifer Hamilton. Lexi Knotts in her final role. Lexi Knotts, senior, has been in the program since the first month of her freshman year. She said she’s come full circle and cannot imagine who she would be if she hadn’t stumbled into the theater program. While the seniors have worked relentlessly over the past four years to revolutionize the program some of the freshmen and sophomores in the cast are earning their chops in the productions ensamble. Shada Shalabi, freshman, said she was surprised at how welcoming the older students were to their younger classmates. They helped open doors in the performance for the new actors she said they probably wouldn’t have been able to get through on their own. She was nervous at first, but quickly fell in love with the program and said the skills she’s learned have already begun to help her with presentations in many of her other classes. The community will see some familiar faces as well in the production. One hidden gem is PCHS TV productions teacher Casey Hamilton who is returning to lend a hand in the cast this year. The last time he was in the show was when he was a senior at PCHS in 2013. He said while he’s always loved the play this is one of the most impressive productions he’s ever seen. Courtesy of Jennifer Hamilton. The show kicks off next weekend at PCHS. Hamilton echoed the sentiments of the students encouraging the community to come and rally in support of the arts programs at PCHS. There is amazing, award winning work happening inside the school’s doors that most never hear about because there isn’t a cult following for the programs. Tickets for the show are only $10 at the door and he guarantees you’ll be blown away by the talent hidden in the high school cast. When: 7 p.m. April 11-13 with a 2 p.m. matinee on April 13.